...GET IT SHIPPED Free Auto Shipping Quote: 1967 Chevrolet Impala, 2 door Fastback, 327 motor, 3sp auto trans, air, P.S, needs brake line. 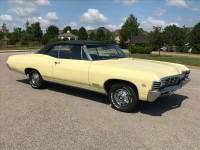 ...GET IT SHIPPED Free Auto Shipping Quote: 1967 Chevrolet Impala SS. Project car needs some TLC. Call for details.